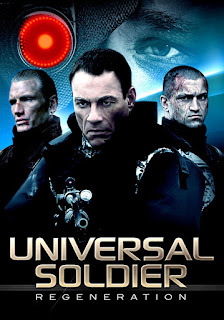 Universal Soldier: Regeneration begins with the children of the President of a former USSR state being kidnapped by a separatist group who have employed Dr Colin (Kerry Shale) and with him one of his new generation of Uni Sols (Arlovski) to help them achieve independence. Unbeknownst to his employers, Colin also has a cloned Andrew Scott (Dolph Lundgren) as an insurance policy. They set up camp in the old Chernobyl power station, threatening to detonate the reactor if their demands are not met within 72 hours. The US army responds to the threat, with the help of their own older Uni Sols, but when that fails they have to draft in Luc (Jean Claude Van Damme), who has spent the past two years with psychologist Dr. Sandra Fleming (Emily Joyce), trying to break his violent programming and retain memories. 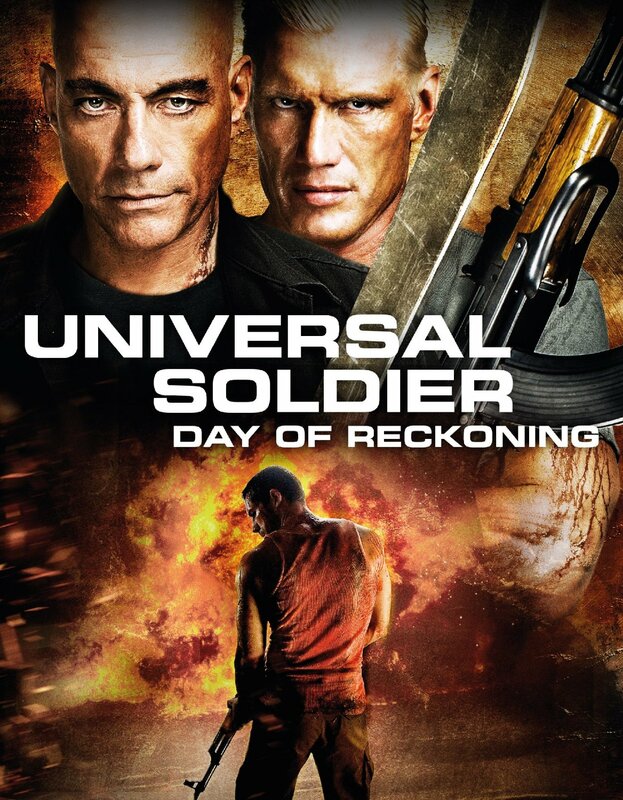 In Universal Soldier: Day of Reckoning, John (Scott Adkins) is woken by his daughter who tells him there are monsters in the house. This turns out to be Luc (Van Damme), who murders John’s wife and daughter. After 9 months in a coma, John wakes, determined to go after Luc, who is now the head of a cult like group that ‘frees’ Uni Sols from their programming. 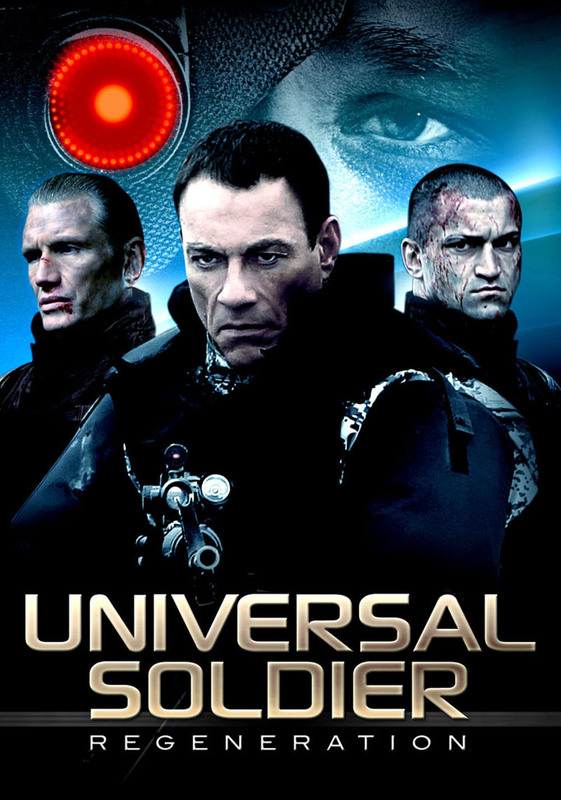 Since Roland Emmerich’s 1992 original, starring Jean Claude Van Damme and Dolph Lundgren as Vietnam veterans resurrected as government controlled supersoldiers who become self aware and go to war against each other, the Universal Soldier series had spluttered back to life in two competing sequel projects. In 1998, two TV movies cast Matt Battaglia in Jean Claude Van Damme’s role of Luc Deveraux and featured Gary Busey and Burt Reynolds. Incredibly though, 1999’s Universal Soldier: The Return, for which Van Damme came back as Deveraux, was perhaps the worst received of the projects. The series lay dormant for a decade before it was revived, 17 years after the first film, for what initially seemed an unpromising direct to video sequel. If there was a glimmer of hope for Regeneration, it was that Van Damme and, for the first time, Lundgren were returning. It was still just a DTV action movie though. Regeneration is in many ways exactly the film you would expect it to be. The script is clearly written with the money saving tactic of shooting in eastern Europe in mind. The characterisation and acting could largely be kindly described as ‘basic’ and the dialogue is often accidentally funny (“Deceased? As in dead?”). Three things save the film: the committed and surprisingly strong performances of Lundgren and Van Damme and John Hyams’ direction. Hyams made his feature debut with this film, having previously made a documentary that featured Regeneration's nominal star, MMA fighter Andrei ‘The Pitbull’ Arlovski. It probably didn’t hurt, when it came to getting Van Damme, that he’s also the son of Peter Hyams, who directed Timecop and Sudden Death, two of Van Damme’s very best films from his big budget period in the 90s. The elder Hyams serves as Director of Photography here, as he has on most of his own films. The minimal plot serves two functions: it acts as a framework for the action and it supplies the film a distinctive and visually interesting central location. The pipes and steel of the Chernobyl location make for an environment that offers both hiding places and striking images, which Hyams puts to use in a series of excellent action scenes. For much of the film the fights are between a lot of faceless and personality free soldiers (some Uni Sols, others just regular guys) and Andrei Arlovski as the NGU. Arlovski looks like an annoyed fist that has taken on human form and some level of sentience. The role doesn’t test whatever acting ability he may have, but it certainly allows him to deliver in a series of powerful fights. 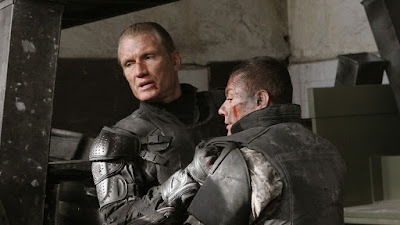 The first incursion the Uni Sols make into Chernobyl leads to a series of fluid and brutal hand to hand scenes, with Arlovski more than convincing as an unstoppable force and at least a physical evolution from the first generation Uni Sols. Where the film comes up somewhat weaker is in its lack of a protagonist. Yes, to a certain degree we follow Luc’s journey from trying to find his place in society (an effective couple of scenes from Van Damme early on) back to being an emotionless, mission focused Uni Sol, but the film never really has the time or the quality of writing to get in his head. It also tries, for a time, to establish the leader of the incursion team (Mike Pyle) as a leading presence, but he’s given little more emotion to play than any of the Uni Sols and, despite a fantastic fight with Arlovski which kicks off the action of the last half hour, never really has a lot of presence. The main attraction, of course, is the return of Van Damme and Lundgren to their iconic roles. Van Damme has the most to do, but it’s probably Lundgren who has the best and most layered scene in the film, as he turns on Dr Colin, asking the questions used to make sure the Uni Sols aren’t thinking abstractly (“You often contemplate... the complexity of life?”) It’s not as striking as something like Van Damme’s famous monologue in JCVD, but it offers some commentary on this role and the opportunity to see that there’s more to Lundgren than just grunting out cool lines and kicking people. The fight between Lundgren and Van Damme is worth the wait, but the film does save the best for last in the showdown with Arlovski. Ultimately, Regeneration is a successful, but basic, reboot. Three years later, with a little less money but seemingly a lot more creative freedom, Hyams would deliver something much more interesting. 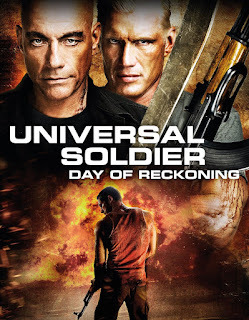 Universal Soldier: Day of Reckoning is a hugely ambitious film. Hyams’ visuals were strong but basic in the first film, he shoots Day of Reckoning like an arthouse film. The style was apparently inspired by Gaspar Noe. The film is propulsive, stylish, constantly visually effective and surprising, and yet it never compromises on delivering the good for fight fans. Day of Reckoning gives us a true protagonist in Scott Adkins, who has been the star of many of the best direct to DVD action films of the past decade (the Ninja films are particular standouts). As John, he’s got a somewhat deceptive role. It starts out as a very basic man out for revenge character but as the plot twists so does what we understand of the character. A big reveal at the beginning of the third act asks the most of Adkins as an actor, and he’s reasonably effective, but again Hyams understands the gifts and the limitations of his cast and, largely, tailors the film to play to their strengths. For just $8 million, Hyams delivers some images and scenes that, while not on the same scale, shame the creativity and impact of much of what Hollywood is doing with $200 million a time. The more conventional scenes are impressively executed, take the car chase that leads into a fight between Adkins and Andrei Arlovski (playing what may or may not be a clone of the NGU he played in Regeneration) in a sporting goods store. There is some strong prop use here (the huge barbell weight and the baseball bat duel), but for the most part it’s simply a brilliantly choreographed hand to hand fight scene. Arlovski and Adkins feel evenly matched and Hyams keeps it simple while allowing the two of them to cut loose in a fast and furious sequence with a killer ending. However, it’s when Hyams cuts loose that the film truly excels. The first long tracking shot through a brothel as Arlovski kills his way to a confrontation with Lundgren is a case in point. Soaked in lurid neon, fluid and brutal, it plays like a budget version of Refn’s Only God Forgives (which it may well have influenced, given that Refn hired Hyams to direct the Maniac Cop remake he was aiming to produce) via Enter The Void. It’s the kind of scene you don’t expect in a film like this, and Hyams just keeps delivering those kinds of moments. While this is very much an action film, Hyams often finds striking effect in stillness. This is especially true of Van Damme’s brief appearances in the first and second acts. In this film Luc is largely a vision, induced when Uni Sols are drugged, there to rescue them from their programming. Depending on your point of view he’s somewhere between terrorist and cult leader. When we see him it’s in strobe lit sequences; shaved bald, standing still and telling the Uni Sol he wants to free them. It’s a strikingly different take on the role, and perhaps Van Damme’s best performance. We never know for sure if this is the same Luc from Regeneration, but I feel like Van Damme plays the role as though it is, and this feels like a logical step for a ‘man’ whose psyche has been reshaped so many times without his consent. The film doesn’t go there explicitly, but it’s an interesting underlying idea. The stillness of much of Van Damme’s role makes it all the more striking when we finally see him ready to confront Adkins at the end of the film. Luc’s bald head is covered in paint; white on top, black underneath, perhaps an unconscious reflection of the two very different Lucs we have seen in the franchise. He’s stock still as John approaches, but the speed with which Van Damme can move is still astonishing. Any of the three main fights in the film - the mid-movie bout with Arlovski’s NGU or the confrontations with Andrew (Lundgren playing the Lieutenant to Van Damme’s Commander this time around, in an inversion of the first film’s dynamic) and Luc - is impressive enough to serve as the final fight in another action film. By the end Adkins has gone totally feral, and the choreography becomes less precise but more furious as each scene progresses into the next. Day of Reckoning is a spectacular achievement for its budget. It shows more ambition and achieves more impact (viscerally if not always intellectually) than almost any recent theatrically released equivalent and I feel we can see some level of its influence in some of the better recent Hollywood action films, like the John Wick movies or Atomic Blonde. The fact that John Hyams hasn’t made a film since (the Maniac Cop remake appears to be dead) is little short of criminal. How Can You See Them? Both films are widely available on DVD and Blu Ray, and can be found very cheaply. I highly recommend picking them up.